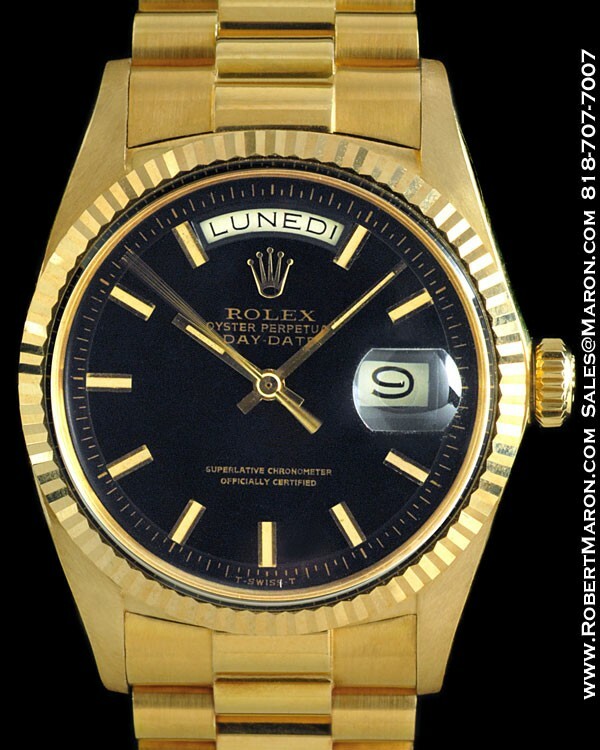 Here is an extra-crisp and extra-clean vintage Rolex 1803 Day Date with rare matte black dial with FAT golden hour markers. The solid 18k gold President bracelet is extra-tight and clean also. One of our nicer Day Dates for sure. Original 36mm 18k gold case with plastic crystal, original screw-down crown (operating perfectly), (you guessed it) extra-crisp fluted gold bezel, C.O.S.C. Certified Chronometer automatic winding Rolex Caliber 1556 with 26 jewels adjusted to temperature and in 5 positions, and matte black dial with applied golden hour markers and original golden baton hands. Full day on display along with date.